If you have not made your vacation plans and live within a few hundred miles of Williamsburg VA, or if you happen to crave TSA molestation, now might be a good time to check out the walk back in time at early capitol of Viginia. You can travel down the same streets that Patrick Henry and Thomas Jefferson walked. You may even run into President Washington or Marquis de Lafayette. The children, even those in their 60s will find the early craftsmen fascinating as they explain how created the necessities of life in the eighteenth century with simple tools and a little ingenuity. However, it would be best study your history before treading these hallowed streets. The physical plant is superb, but the funding for much of the work came from the John D Rockefeller family that did not exactly have the founders passion for freedom of the masses. Then there is the proximity to William and Mary, a liberal arts university with the emphasis on liberal. This was amply illustrated during a presentation that was billed as an example of the influence of the clergy on the war for independence. We were treated to a re-enactment of a sermon by John Camm, the colleges’ president from 1771 to 1776. 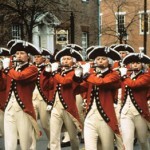 Instead of hearing the stirring rhetoric of patriots like John Witherspoon or John Peter Muhlenberg, we heard the words of a loyalist promoting the divine right of kings along with the concept that not all men were created equal – that some were meant to have a station in life above others to insure a smoothly functioning society. It is much the same struggle we have today. Chatting with the many characters you meet on Duke of Gloucester Street you learn about the political intrigue of the period as well as the price of eggs. It helps to put humanity to history. The colonists saw themselves as British subjects – to the point where they were the least likely of the colonies to desire a break from the mother country. One gets the feeling that it would have taken some pretty heavy oppression or contemptuous action to move the average Virginian to rebel – Patrick Henry not withstanding… and when the people of the Old Dominion decided to break away, the quest for freedom had gone too far to turn back. Williamsburg is a wonderful trip back in time and now, since the current regime has trashed the economy, it is a bargain. The streets are much less crowded than previous years. The hotels are going for virtual fire sale prices. Check them out on the booking sites. You will be amazed. It is good to get this connection to our past. And stop by one of the taverns for sumptuous, but pricey period dining. While you are in the area, Jamestown and Yorktown are just around the corner. It is an inspiring and sobering site to stand where the colonists, fighting for independence slipped into the British redoubt in the middle of the night with only mounted bayonets to win the final victory of our struggle with the British masters. Bring the kids too… they will learn more history in a few days than a lifetime of public school indoctrination will provide.